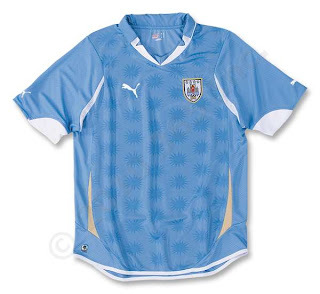 The hosts and winners of the very first World Cup - Uruguay - have returned to the greatest stage in World Soccer, seeking their third trophy, and a spot among the elite national teams who have won multiple titles. Now, the Charrúas are all geared up and ready to hit the South African pitch! 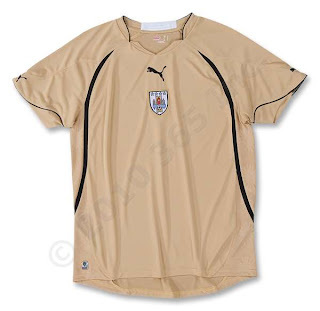 Official PUMA Uruguay National Team 10/12 Home/Away Soccer Jerseys! As previously stated, the new PUMA designs are unique and cool, and these are no exception. The home shirt also features sublimated sunburst patterns throughout, and the away features the team crest and PUMA cat on the center chest.